The Sousa Archives and Center for American Music will continue exploring America’s evolving artistic dialogues of race and identity for this month’s Black History Month. The Center is sponsoring a special performance by the Chicago Modern Orchestra Project ensemble on February 24th, two historic silent movie showings on February 24th and 25th, lectures by Renée Baker on her work as a composer and conductor for the University’s cinema studies and music students on February 25th and 26th, and children’s educational programming for the King Elementary School students on February 26th. 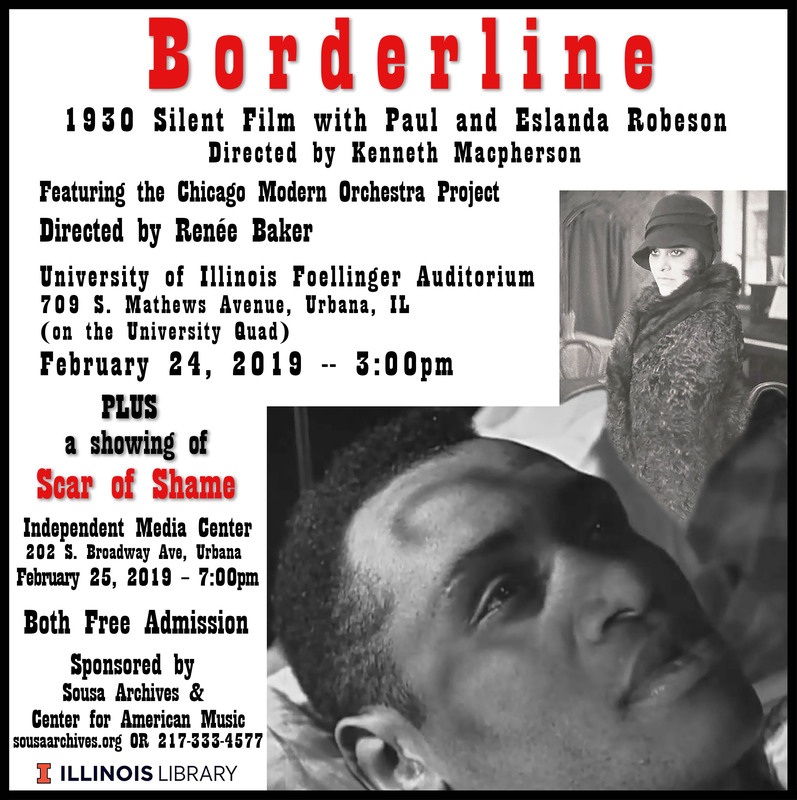 The three days of programming will kick off with a special premier performance on February 24th of Renée Bakers’ new film score composed for the newly discovered silent movie, Borderline. Kenneth Macpherson’s visually compelling movie about interracial and LGBT relationships during the 1920s stars Paul and Eslanda Robeson. The film’s showing will be accompanied by a live performance of Renée Bakers’ Chicago Modern Orchestra, and following the showing of the film, there will be a 45-minute discussion with Renée Baker and the audience about her work on this movie and her continuing interest in reviving historical silent movies with her new film scores. That following evening she will show David Starkman and Frank Perugini’s 1927 silent film, The Scar of Shame, staring Harry Henderson, Norman Johnstone, and Ann Kennedy, at Urbana’s Independent Media Center at 7:00pm. This second film is considered one of the best independent black films produced at the height of the silent movie era. It dramatically portrays the societal struggles of individuals seeking and eventually failing to improve their black urban lives in America during the 1920s. Renée Baker’s new film score will also accompany this historical movie, which draws its musical inspiration from the many societal issues presented in this historical film. Following the film’s showing, Ms. Baker will talk about her work on this film with the audience. Both programs are free and open to the general public. For further information about these exciting programs or her work with University of Illinois and King Elementary School students, either call 217-333-4577 or email Scott Schwartz.